St Pauls, Bristol-based Metacomco had been quietly writing system software and compilers for the Motorola 68000 processor, and had also previously licenced its own 8086 Basic interpreter for $800,000 (about £1,837,300 in 2019) to Digital Research, but it wasn't otherwise well known. That was until it became clear that Microsoft's port of its own Basic for the Amiga wouldn't be ready in time for the launch, and the tiny company was contracted to provide both a version of Basic and the operating system for the new machine. Metacomco's marketing manager Peter Mackeonis recounted how "some Amiga people came to our stand at Las Vegas CES in 1984 and asked if we did anything on operating systems. Four months later they rang up and asked for a list of our ideas for a new machine". The company won the contract only six months before the Amiga's US launch, but had something of a headstart as it already had a suitable single-user multi-tasking operating system in the form of Tripos, which had been developed at Cambridge University in the late 1960s. It had also already ported two of its Tripos languages - an Assembler and BCPL (the forerunner of C) - to the Sinclair QL, a 68008-based micro. Nevertheless, producing an entire operating system for a new machine in only six months was certainly a tall order. Metacomco's Tim King, who had overseen the entire Operation Amiga from the beginning, said of the effort that "It was really hard work [and] I know at least three members of the Amiga team with camp-beds in their office. They even work weekends". King himself spent a lot of the time in a three-week rotation between Bristol, Monterey, where Metacomco had a small office, Commodore's HQ in Pennsylvania and Amiga on the West Coast of the US. 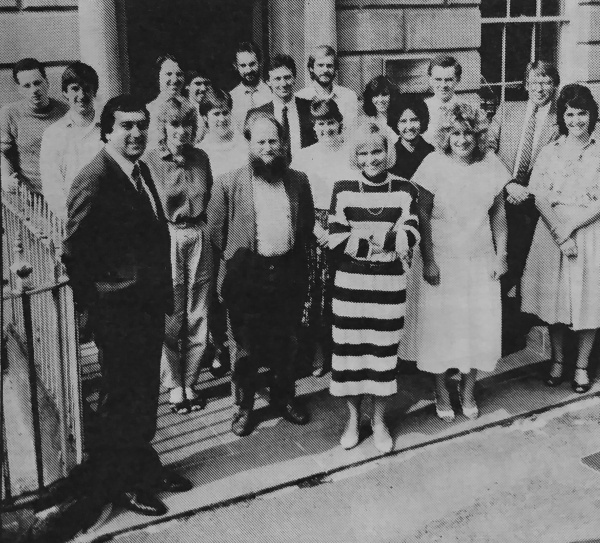 Metacomco staff outside their Bristol HQ. Tim King is front, left, whilst Derek Budge is second from right, © Personal Computer World December 1986Pam Clare, Metacomco's technical manager added "While our AmigaDOS is certainly adapted from Tripos, we have had to do a lot of modifications to make it acceptable for a modern system. We've had to customise it to make the best use of the Amiga's graphics and sound capabilities - getting it to address the Amiga's custom chips has been the major modification". The company was not hanging around with other deals, as it was about to launch a version of C for the QL at the September Personal Computer World show, and as well as selling its existing versions of Assembler, BCPL, Lisp and Pascal for the QL, it was also on the cusp of launching software for the Atari ST (this advert features software for all three machines). However, it had ruled out the Apple Mac, launched the year before, as it considered its links with Digital Research to be more fruitful. Mackeonis said "I would like to see Metacomco become a major force in the market place - the new Digital Research if you like, but home grown". Metacomco also saw its AmigaDOS as a "pre-Unix system" and intended to licence it to other micro manufacturers, with Mackeonis continuing "It's certainly a strong contender for the 'windows market'. As yet there is no standard operating system for the 68000 chip, so it would be good if we can get Tripos going now". 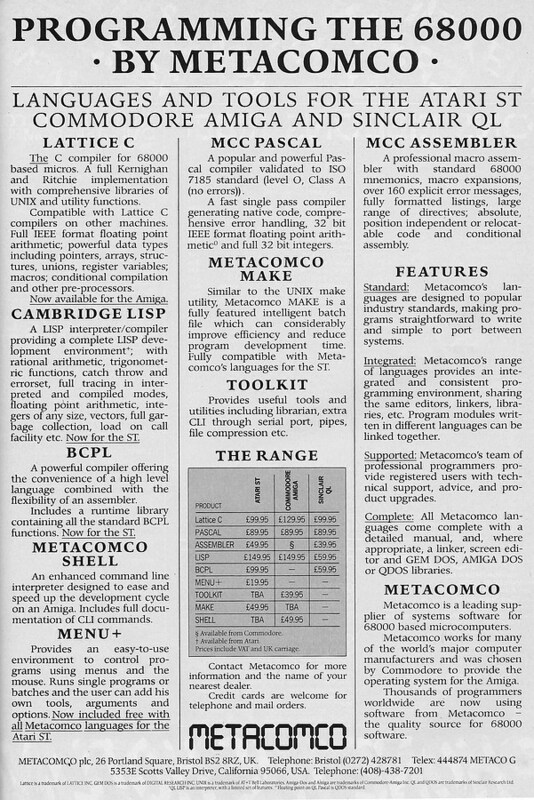 Dr Tim King of Metacomco, © Personal Computer World September 1988The version of Tripos that Tim King of Metacomco had based AmigaDOS on had been licenced from the University of Bath, although the software itself was actually public domain, with many other versions available from both the University of Bath and Cambridge University. This became relevant when King, plus two or three other members of staff, left Metacomco to join a new British company called Perihelion, founded by Jack Lang - a situation which no doubt gave Commodore some headaches and which led to a rift between King and the chairman of Metacomco, Derek Budge. After leaving, King approached Commodore to offer to maintain the code that he had written - acknowledging that any royalties still belonged to his former company - but Budge, who had apparently acquired more Metacomco shares in order to "tighten up decision making" - a move that King was opposed to and which led to the split - reckoned that Tripos didn't belong to King and that any support work should be done under contract to Metacomco. King however believed that the contract between Metacomco and Commodore ended as soon as he had left Metacomco, but either way, it seemed that no-one was quite sure exactly who had the rights to support and maintain AmigaDOS, and Commodore wanted the situation cleared up. This was a view echoed by Guy Kewney in his December 1986 edition of Newsprint, when he wrote "those of us who feel that the Amiga is an important step forward in personal computing should feel the same way - Commodore has had enough bad luck with the machine already, and it will be a tragedy if this dispute causes it to fall further behind". 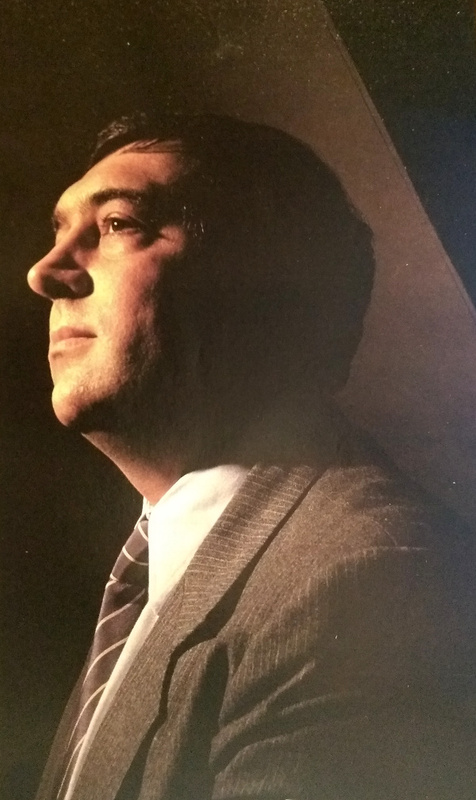 Perihelion would later go on to develop Atari's ABAQ Transputer computer system.